I sat up until dawn, switching from channel to channel to watch foolhardy television reporters venture out into debris-choked winds or the eye of Hurricane Ike, which made landfall at Galveston just past 2 a.m. Dr. Jeff Masters' at his WunderBlog reports "Ike carried a storm surge characteristic of a Category 4 hurricane to shore. The destructive power of Ike's storm surge rated a 5.0 on a scale of 0 to 6 just before landfall, according to the experimental Integrated Kinetic Energy (IKE) product of NOAA's Hurricane Research Division. This is about the same destructive potential Katrina had at landfall." There was no sign of wind or rain in Austin by dawn. I finally fell asleep, waking up at 5:00 p.m. to discover that EVERY BROADCAST CHANNEL except PBS had on sports (football), and PBS was airing a repeat of Ask This Old House. I had to wait until 6:30 to get coverage of the hurricane's damage. If you cannot afford cable, this is the crap we must watch. It's going to take a long time to assess the toll. One piece of good news is that at the last instant, Ike took a little jog to the east (funny how they keep doing that) and hit Galveston full on instead of a little to the south, which means the surge there only reached 13.5 feet. This is probably the reason there's any city left at all on the island. 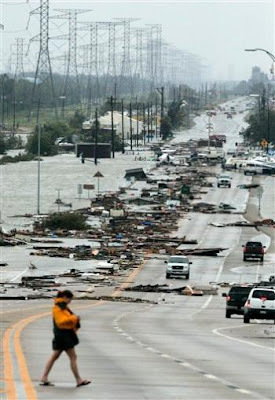 Houston got hammered by wind, especially the downtown area where gusts higher up in the air reached the 150 mph mark. Ike remained a Category 2 storm at landfall by the thinnest of margins, with top wind speeds at 110 mph -- the shift to Category 3 begins at 111 mph. The surge moved instead to Clear Lake, Kemah, and northeast to Port Arthur, where less populated areas mean the waters may have done less than anticipated destruction and loss of life. Dr. Masters' states "Galveston was also lucky that Ike did not have another 12-24 hours over water. In the 12 hours prior to landfall, Ike's central pressure dropped 6 mb, and the storm began to rapidly organize and form a new eyewall. If Ike had had another 12-24 hours to complete this process, it would have been a Category 4 hurricane with 135-145 mph winds that likely would have destroyed Galveston." Our local news says 4 million people in Texas are without power, most of them with the CenterPoint Energy utility, who is repeatedly saying it will likely take weeks to restore electrical power. The last major hurricane in that area, Alicia in 1983, left 750,000 people without power for 16 days. This morning, Austin had over 6000 evacuees in 22 shelters, plus 125 in a special needs shelter at the Austin Convention Center. In addition, every one of our 22,000 hotel and motel rooms were occupied, and every RV and trailer park were jammed. Our local Red Cross is begging for volunteers, and the area food bank is running constant requests for food or monetary donations. However, the effort to evacuate, house and feed folks has run much smoother than it did in 2005 with Rita. Systems are now in place to do the work that FEMA once did. I have to wonder, thought, what will happen Monday or whenever local officials in Galveston and Houston say it is all right for evacuees to return. Without power, and with a boil water order in place, even if their house is intact, how will people manage? The Houston metro area has a population of 6 million. That can easily overwhelm local resources. Despite the mandatory evacuation order, an estimated 140,000 people rode out the storm in Houston and Galveston. During the 4 hour period from the time the outer bands of Ike began hitting shore and nightfall, Galveston's 911 line received 1200 calls for assistance. By that time, no one could respond, and whatever trouble people were in, they were alone for the night. One elderly but tough-looking old guy in Surfside Beach was interviewed this afternoon, having survived in a frame house on stilts about 30 feet from the ocean. He intended to leave and had arranged for a ride with a neighbor, whom he said "ran into town to buy something and never returned." He was rattled but intact when the reporter discovered him: He was the only person to remain in that devastated town during the hurricane. Search and rescue was only this morning being able to begin the work of going door to door to check on the fate of those who stayed behind. There are three known fatalities so far. One woman was asleep in her bed in Pinehurst when a tree fell on her house and crushed her. A 19-year-old man was on the end of a jetty in Corpus Christi as Ike began approaching, and was swept into the water. Two people with him jumped in to try to save him, and one of them suffered serious injuries, having to be flown out by helicopter to an inland medical center. The teenager's body has not been found. The most tragic death was earlier in the day, when a family was preparing to evacuate but at the last minute the father, a professional tree-trimmer, decided to cut down a tree which threatened to come down onto their house. His 10-year-old son was somehow under the tree when it came down. This is a parent's unthinkable nightmare, from which I cannot imagine recovery. A refugee from Calhoun County, Ku Paw, was at an evacuation shelter in a New Braunfels middle school when she went into labor. Dr. Mark Burns, who specialty is geriatric psychiatry, happened to have stopped by the shelter to check on a few elderly evacuees. He wound up delivering his first infant in 20 years, on the floor of the girls' restroom. Both mother and baby were later taken to Christus Santa Rosa Hospital. When asked what it was like to deliver a child after such a long gap, Dr. Burns replied it was "like riding a bicycle". A boat and yacht warehouse in Galveston began burning at nightfall and could not be reached by firefighters. Another neighborhood in Galveston lost several houses to an unchecked fire. The historic Balinese Room along Galveston's water front, built 79 years ago and added to the National Register of Historic Places in 1997, is no more, swept away by the storm surge. It once had Howard Hughes as a patron, and featured entertainment by Frank Sinatra, Bob Hope, George Burns and the Marx Brothers, among others. The JP Morgan Chase Tower in Houston, the state's tallest building at 75 stories, suffered extensive damage and continued to rain down glass and office furniture on the streets of downtown this afternoon. It is theorized that the taller a building in Houston, the worse the damage because of the higher velocity winds at altitudes. Austin never lost power, and as I type this a loaf of potato bread is filling my house with delicious smells. (I used Barbara's organic potato flakes and pepperincino flakes, plus a mix of organic whole wheat and white flour.) I feel lucky. Our mayor, Will Wynn, is currently meeting with others to figure out what to do on Monday, when our local schools being used as evacuation shelters will be needed for classes again. He can be a goober, but I trust him to do the decent thing, after his performance during Katrina and Rita when he went all out to bring in evacuees. Austin's current population is over 1.5 million. Since this is three times the population of Alaska, does this mean Will Wynn is triply qualified to be a Vice Presidential candidate? Let's put lipstick on him and find out.